The Prince of Darkness himself - or the Godfather of Shock Rock as he’s sometimes known - has licensed his classic album ‘School’s Out for Summer’, and his iconic image and stage tricks to create this thrillingly terrifying slot. In an epic partnership between Spike Games and the legendary Alice Cooper, this spine-chilling slot featuring a death row feature and other death-defying features has been produced. 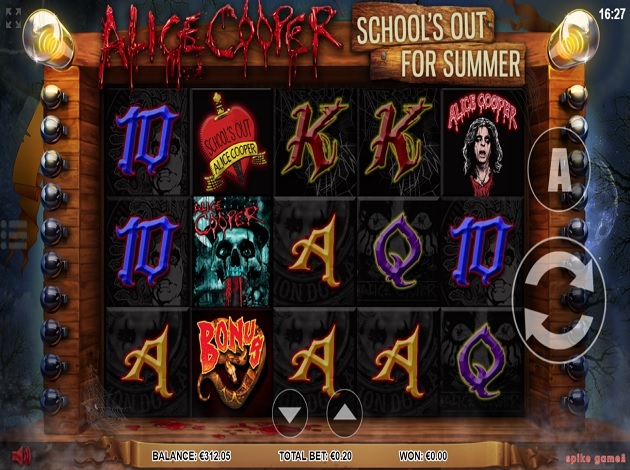 Alice Cooper’s School’s out for Summer is a 5-reel game with 3 rows and 20 fixed paylines. The game comes with an RTP rate of 95% and 3 amazing features: Twin Wilds, Deathrow, and a free spins gambling feature. Play this game from a minimum bet of € 0.2 or if you dare, go for a maximum bet of € 40. The symbols are all heavily-inspired by Alice Cooper’s famous shows and look. These include the rock singer himself with his heavy eye makeup and his name in dripping red font, a terrifying blue skull with blood coming out of its mouth, and the singer’s scary eyes with heavy make up as a symbol on their own. The eyes are the wild symbols that are stacked on the reels and can also become sticky wilds during the free spins round. Other symbols include a traditional tattoo-style heart with the words ‘school’s out’ and a sword running through it with a yellow banner that reads the singer’s name. This is a special symbol to look out for, as it can lead you to the Death Row game where grand prizes lie. The bonus symbol is a huge coiled snake with ‘Bonus’ written on it. There are also the lower value symbols which include the traditional playing card letters and numbers. To get to the free spins gamble game you need a hit of 3 or more bonus symbols landing anywhere on the reels. Before starting the round, you will be offered a gamble ladder presented on the large coiled snake. You get 3 lives and your task is to try and get highest number of free spins possible by pressing the gamble button when the light is flashing on the highest amount. You can collect your free spins after 3 gambles and the round starts. If you’re lucky enough to get 5 symbols of the heart, you’ll activate the Deathrow bonus. For such a terrifying name, it holds massive prizes in store for you once activated! All you have to do is choose from one of the six switches presented to reveal the prize. Once revealed, Alice Cooper strapped into a chair will pop up, as your winnings are displayed in front of him. Besides these 2 amazing bonus features, there’s also the Twin Wild bonus that can happen at any random point during the game. The Twin Wilds are active on reels 2 and 4 only and when the feature is activated, 2 dark stripes with Alice Cooper’s eyes will appear and those reels will become fully wild! A number of free spins is also triggered, during which the wild reels will remain sticky for the duration of the round. The highest paying symbol in the game is the tattoo-style heart. For a hit of 4 on a payline, it comes with a reward of 200 coins. Next, Alice Cooper himself earns you a 200-coin prize as well, but for 5 symbols on a payline. The other high value symbol is the blue-tinted skull, paying 120 coins for 5 of a kind on a payline. The lower value symbols pay between 30 to 100 coins for a 5 matching symbols. With a great soundtrack blasting in the background featuring popular songs from his album, the shocking graphics and the design of the reels really capture the feel of the famous Alice Cooper concerts. The animations for the gamble feature and the Death Row feature are particularly impressive and terrifying! The reels are framed in a heavy wooden frame, buzzing with electricity and surrounded by fog. On the left side of the reels, you’ll see a button in the middle where you can access the paytable. At the bottom of the reels, you can adjust your total bet. The spin button is on the right side of the reels, along with the autoplay option which lets you spin from 5 to 100 automatic spins, setting a loss limit and a single win limit too. Spike Games have managed to recreate the rockin’ vibe of Alice Cooper’s buzzing shows perfectly in this slot. The main features come with impressively rewarding prizes and the gaming experience is extremely entertaining, especially if you’re a fan of the singer. Check out Alice Cooper himself playing his own slot right here! Spike Games is an online casino gaming provider established by Rob Anderson back in 2014. Long before that, however, Anderson held a position at Barcrest as a job visualiser in 1991, where he was responsible for bringing to life the team’s designs, gaining valuable knowledge of the game design process first-hand. He then moved on to studio manager at BWB in Newark, where he was responsible for creating some of the most successful games, particularly for the German market. Many years later, Anderson founded Spike Games, with its main headquarters in England. He had also created his own gaming firms such as Cometa Wireless and Alchemybet, before focusing fully on Spike Games. For this business venture, Anderson had one simple goal: to create products that are completely new to the online casino world and to distinguish his games and products from the thousands being released at a rapid pace. With over 20 years of experience, Spike Games knows the industry inside out and that’s why they feel confident about the future. They promise to deliver the next generation of unique, top-quality HTML5 games with amazing, high-definition graphics, that are highly profitable for gaming businesses. Don’t miss out on the opportunity to play a thrilling Battle with our special, unique and very first social online casino experience – Battle of Slots. Videoslots gives you the chance to play first time Battles against your friends and other players on videoslots.com with games from NetEnt, Thunderkick, and Play’n GO. There is only one Battle of Slots – and you’ll only find it on videoslots.com!